… to share, so let me jump right in by giving a HUGE congratulations and mighty woo-HOO to Laura Shovan for her recently announced two book deal with Random House! Poet and educator Laura Shovan’s debut middle-grade novel in verse, THE LAST FIFTH GRADE OF EMERSON ELEMENTARY, in which a class of fifth graders learns that their school will be torn down and replaced by a supermarket, and then takes their teacher’s 1960’s political teachings to heart as they fight to save it, to Wendy Lamb at Random House Children’s, at auction, in a two book deal, by Stephen Barbara at Foundry Literary + Media (NA). 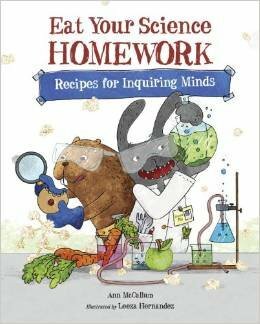 I’m also happy announce that Ann McCallum will soon be hosting three launch events celebrating the August 5th release of her book, Eat Your Science Homework: Recipes for Inquiring Minds! Hungry readers discover delicious and distinct recipes in this witty companion to Eat Your Math Homework. A main text explains upper-elementary science concepts, including subatomic particles, acids and bases, black holes, and more. Alongside simple recipes, side-bars encourage readers to also experiment and explore outside of the kitchen. A review, glossary, and index make the entire book easy to digest. In celebration of the launch of Eat Your Science Homework, Ann will be hosting 3 separate events. Please come to one or all if you can– appropriate for children ages 6-12, their adults, or readers of any age. Rumor has it that there will be free giveaways including some tasty math and science recipes. Hope to see you there! Congratulations on your upcoming release, Ann! In memory of longtime volunteer Jack Reid, the MD/DE/WV SCBWI Region offers two scholarships (one for a writer and one for an illustrator) to the annual 2-day September conference. This year’s event will take place Sept. 20 and 21, 2014. Writers wishing to apply should send up to 10 double-spaced pages of a work for children. Illustrators should send up to 3 jpg selections of their work. A cover letter, stating reason for applying, should accompany all entries. When entering, state the year in which you are applying for a scholarship. Please include your name on your cover letter, but NOT on your actual manuscript or illustration. Submissions will be judged anonymously by the scholarship committee. In “Heroes without Capes” author Marc Tyler Nobleman will share his adventures researching and writing about Batman and Superman. Agent Jennifer Laughran will reveal the truth behind many publishing myths. Please note that applicants must be current SCBWI members, live within our MD/DE/WV region, and not be currently represented by a literary agent or with a project (manuscript or illustrations) currently under contract. Please email entries to mddewv@scbwi.org. The application deadline for this year is Friday, Aug. 1, 2014. Winners will be announced in mid-August. Please save the Sept. 20 and 21 dates. We look forward to seeing you then. This entry was posted in Conference Information, Member News and tagged ann mccallum, conference scholarship, laura shovan, Random House Children, scbwi, Stephen Barbara. Bookmark the permalink.